Spring is finally here to stay, and the Hub is gearing up for another Outdoor Adventure Expo with our friends at Midwest Mountaineering! In addition to that sale, we'll also be offering a Free Bike Valet for anyone attending the Expo, located on the plaza outside our store. Don't worry about congested bike parking or safety, because we've got you covered! Oh, and don't forget to sign up for our Free Raffle as well, located at our booth inside the Expo tent! Breaking News: some of our friends at Surly Bikes will be joining us at our booth in the Expo tent from 9am-5pm on Saturday to answer all of your Surly product inquiries! In addition to all of the great clinics from Midwest Mountaineering, Hub staff will be leading three seminars to help get you prepped for a summer's worth of riding in the great outdoors. The bicycle is another mode for quiet exploration of wild spaces both near and far. Fortunately, adding touring and bikepacking to your quiver of options is not out of reach. 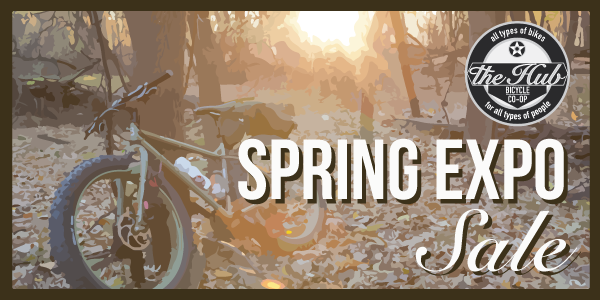 Join representatives from The Hub Bicycle Co-op and SURLY Bikes to learn the basics of getting started. John Fleck, Surly Sales Manager, will preview a newly released touring bike designed to be an ideal option for those wishing to try touring and bikepacking both on- and off-road. Whether you’re looking to explore the local countryside or test your endurance on longer routes, gravel and mixed surface roads provide an exciting and unique cycling experience. Many bikes are well suited for riding these roads, and you won’t need much specialized equipment to get out for your first ride. For those seeking more of a challenge, some of the oldest and most well-known “Gravel Grinders” at varying distances take place within a half-days drive from the Twin Cities. This class will be taught by Hub Education Coordinator and Worker-Owner Elena with help from her touring buddy and fellow Hubster Chad. In addition to seeing bike trails and roads, bike camping gives cyclists the independence to cycle anywhere—through state parks, national parks, forests, even around the globe. This presentation will show a bike camping trip that Steven Malikowski took across the UK. It will also show simple ways to get started with bike camping on both guided or independent tours. Steven will also present bikes and gear used for bike camping, available from The Hub Bike Co-op. Because of the Expo tent, our validated parking is unavailable Monday, April 23th through Monday, April 30th. Click here for event and parking map.